Include our Mexican Shrimp Cocktail Recipe at your next fiesta. 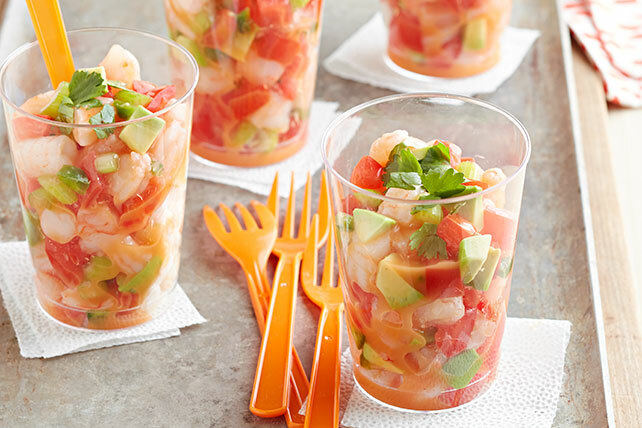 Our colorful Mexican Shrimp Cocktail Recipe is made with avocado and chipotle dressing. Whisk dressing, tomato cocktail and lime juice until blended. Add to shrimp mixture; mix lightly. Prepare using plain tomato juice or spicy vegetable juice cocktail. Serve topped with your favorite TACO BELL® Hot Sauce. To seed a tomato, cut tomato crosswise in half. Then, gently squeeze each half to remove the seeds and juice.